Accurate Grease Fittings Rivet Detail Around Rim Back Side Detail on Wheels Includes a Spare Wh.. Accurately Detailed Set of Late Big Bearing Wheels Includes Accurate Face Detail and Grease Fitti.. 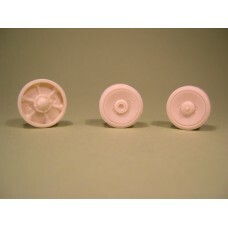 Accurate Plain Dished VVSS Sherman Wheels Accurate Grease Fittings on Wheel Face Back Side Wheel.. Solid Wheel Used on Many Late Production M3 Lees Often Seen on Tanks in Service in North Africa ..